The ANCA just released a strongly worded critique of the so-called Madrid “Principles” – using the word “principle” is galling in this context because Madrid “Articles of Artsakh Capitulation” might have been a more accurate, representative, and honest name for the document in question. Any number of observers of the years have noted that Artsakh may be the only case in history where the winning side of a war is expected to make all or most of the concessions. The Karabakh Movement broke out in the late 1980s, before the fall of the Soviet Union. Petitions and public gatherings/rallies were met with brute force and massacres, leading to a new Armeno-Tatar (Azeri as the people are now referred to) war, resulting in the independence of Artsakh. In addition, hundreds of thousands of Armenians and Azeris became refugees. Periodic sniping and small clashes along the “Line of Contact” (diplomatic polite-speak for “battlefront”) have been the norm since, along with endless, fruitless, negotiations. Along the way, a set of “principles” were propounded in Lisbon in 1996 that were crammed down Armenians’ throats that were utterly ridiculous. These came about in the context of discussions of security arrangements and other conflicts in the European sphere. In 2007, the Madrid document came out, only slightly less bad than Lisbon. These documents and various negotiations were often marked by chatter about Armenian concessions, i.e. liberated land being given by Artsakh to Azerbaijan, with nothing to show for that action in return except vague promises of rights and security. All of these ignore or radically downplay, the importance of two key, and intertwined, factors that mitigate in favor of the Armenian side. Factor 1= The internationally accepted principle of the right to self-determination for people (the basis of Artsakh’s demands), largely, has been made subordinate to the principle of inviolability of borders. Factor 2= The governing laws when the people of Artsakh sought separation from Azerbaijan and union with Armenia were those in the Soviet Constitution which permitted such a change. Thus, without Azerbaijan’s murder and mayhem, Artsakh would have been part of the Republic of Armenia long ago. Some circles even argue that refugees, residents of villages near the line of contact, women, and other groups that are usually not included in post-war peace talks ought to have a voice in the Artsakh negotiations, how much more reasonable and sensible is it that Stepanakert/Sdepangerd ought to be present at the table? First nothing can be “crammed down ones throat” without acceptance and or lack of negotiating skill and vision of leadership. Levon Ter-Petrosyan was president In 1996 and a weak and corrupt president at that. Ter-Petrosyan was eager to give away lands won by blood as a way to end hostilities but was rejected by the people and ultimately rid as president. The 2 later Karabakh president were more realistic but should have refused point blank any concession as a negotiating platform as winners do not concede anything. Unfortunately the same 2 Karabakh presidents were extremely corrupt and did more damage to the Armenian Nation as amass exudes was a result of their miss governance and miss rule and blatant greed for self enrichment. 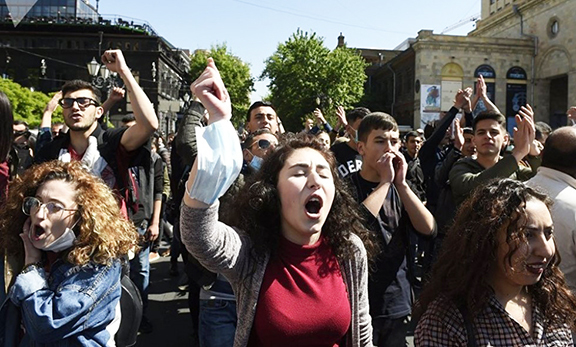 Armenian officials need not be afraid of the MINSK group. Armenian officials need to make clear that Artsakh independence will never be questioned as a starting point of all negotiations. Also any “concessions” must be immediately accompanied by the acknowledged independent and free Arstakh. NOTHING LESS..Who agrees to give away Armenian lands for future promises? A grade school negotiator.. A weak one at that..Its seems Armenians will immediately steal and oppress other Armenians with impunity but quiver in fear when it comes to protection of rights with odars. No one needs leadership or mentality such as this..Unity and betterment of ALL is the only answer: One Armenia. Artsakh and diaspora.. All else are traitors.